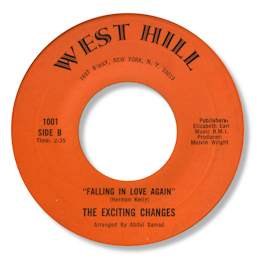 The infectious and melodic deep ballad Falling In Love Again was the only single that this group had out. The harmonies from members Doc Green, Tommy Evans and Hughie Beauregard, who all had R & B and doo wop pedigrees in other groups is particularly impressive. But the key to this track's impact is the intense, screaming lead from Leo Wight who had some fine 45s under his own name, of which the tasty early soul “Is It I” (CB 5008) is a favourite of mine. UPDATE ~ You can find info on Leo Wright's solo career here.